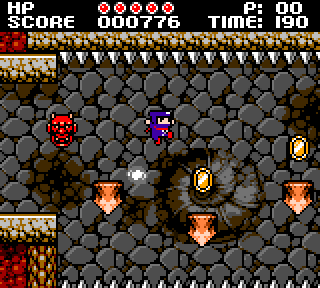 A few days ago the indie game Ninja Senki was released after a year of development. In short, it’s a Ninja Gaiden inspired (a lot of pages say Mega Man but I don’t agree with that) retro platformer that looks very late 1980s and also has that late 1980s difficulty. The game is hard. This is why it reminds me more of Ninja Gaiden (besides the theme) than Mega Man. The gameplay is very simple, in that you can only run, jump and throw shuriken. You can also double jump once while airborne and that skill is available and required from the beginning. Which is perfectly fine. The game chooses a gameplay style and sticks to it with no afterthoughts. The gameplay feels perfect and the high difficulty doesn’t feel unfair as it would with controls that were less than perfect. The game also supports gamepads. I really liked the music and sound effects, they’re pretty much 100-percent authentic (FamiTracker was used to create the sound effects which pretty much makes it sound exactly like a NES game with the chiptune background music). The graphics are simple, obviously, since they imitate the Gameboy resolution (160×144) and the NES palette limitations. In my opinion, some of the graphics could have benefited from some variation. Especially, the few first levels look very monotone and boring compared to the later levels with more colorful backgrounds. It still looks fine, though. But as far as first impressions go, I saw more interesting stuff in the trailer than in the first few minutes of the game. There are multiple endings depending on how well you play which is great considering how hard the game is. It feels like the game knows it’s way too difficult for 2010 so it has some slack (as long as you play your eyes open, you’ll probably be able to buy a continue or two with your score) but still would like you to play a perfect game. There are no save games which I think is not too bad considering it adds to the feeling (you have to play from beginning to end in one sitting just like you did as a kid) but since people who love retro games are not children anymore and actually have stuff to do, the game should have at least some way to continue the game. The game is free (I was a bit surprised of this) and feels great so anyone interested in challenging platformers should check it out.